MADISON, Wis. — A new mural honoring the legacy of musician Otis Redding has popped up in Madison. Henrique Nardi, a Brazilian-born Madison artist, led the project with artists Cyla Costa and Jackson Alves, The Capital Times (http://bit.ly/2epigTp ) reported. 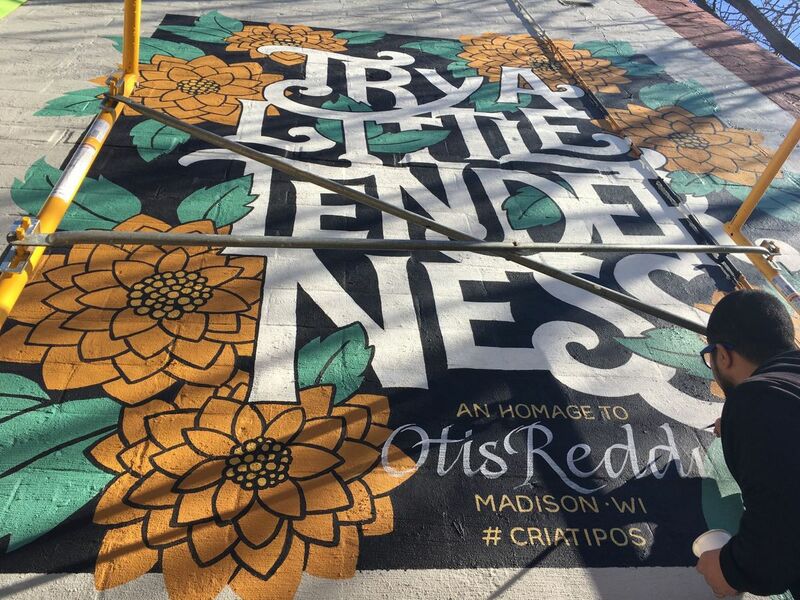 The mural reads “Try a Little Tenderness,” one of Redding’s songs, in white letters surrounded by orange flowers. “It’s such a strong sentiment, such a kind message,” Nardi said. Nardi, who is currently teaching graphic design at the University of Wisconsin-Madison’s Art Department as a lecturer, said he received compliments and positive responses from people on the street who were excited to see the painting. Nardi earned support and funding for the mural with the help of Madison Arts Commission director Karin Wolf. Soon after, Marquette Neighborhood Association president Lynn Lee, who has also created murals, helped Nardi find a location for the project. The artists began their creation on Halloween after Nardi collected approvals from city commissions. Next year marks the 50th anniversary of the death of Redding, who was killed at the age of 26 when his private plane crashed into Lake Monona during a storm. After the success of his first mural, Nardi said he would like to create more.